To capture this idea of the free spirit, I would suggest breaking some rules. Sometimes it is necessary to overexpose a frame slightly and point the lens to the sun for a bit of glare to capture that sense of a different, free, moving reality – Strauss Louw. 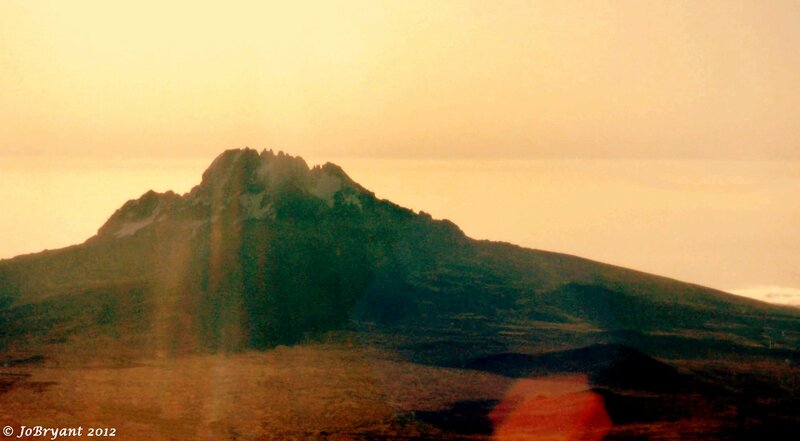 On top of Mt Kilimanjaro I sat and watched the world around me as the sun rose out of the darkness and the cold. And this is what I saw. To really see Mt Kilimanjaro as I did click on her. I didn’t do this on purpose…or perhaps I did. I just didn’t know it at the time. For of all the photos I took sitting on that frozen mountain top…none depict it better than this. As proof that I really did make it to Gillman’s Point…one more shot…this time of another sort of free spirit. Click on the ‘free spirit’ for a better look. So how do others interpret Free Spirit – Check out the Weekly Photo Challenge and find out. Wow, what an achievement, Jo. Perfect interpretation of a Free Spirit! Thanks Marianne. I was rather proud of myself though I ended up losing toenails and with a sprained ankle. Thanks Colline – i was rather proud of myself for making it…but damn it was cold up there. Very cool Jo, and thanks for the instructions to click on the photo to get the larger view! You really need to see the bigger photo to appreciate it i think. I hope you’ve framed that first shot! It’s magnificent! Love the pictures esp. the header of this post. Awesome! I liked the header too…so I thought I’d throw it in there as well. So glad you liked these. Thanks Jennifer…Mother Nature did all the hard work. Just barely. 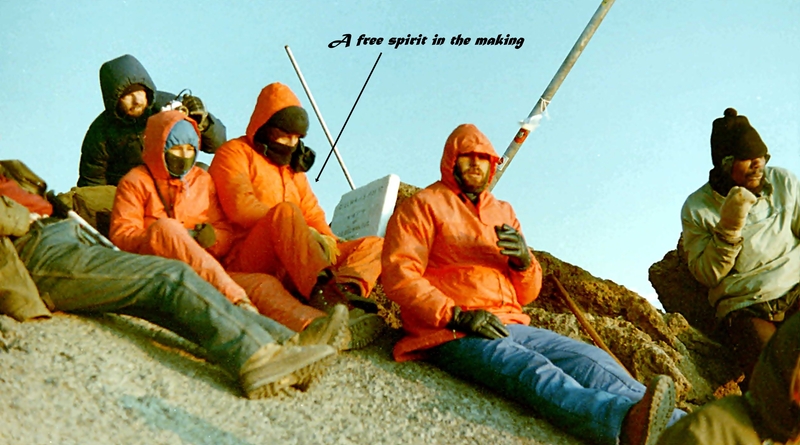 It was so cold up there that one of the guy who had a water bottle hanging against a t-shirt and under all his other clothes…when he pulled it out on top for a drink, it was frozen solid. I’m not sure anymore how I even thought about photos. Can’t you see me shivering on the other one. Just looking at that photo reminds me how cold it was. Oh it was…the whole trip was an adventure. Fantastic, I could never do that! Gilly – I was 25 when I did that…no way I could do it now. It took 50 years to finally find my voice so I figure it is time to use it a little. And it is great to see someone stick up for the athiests for a change instead of denigrating their beliefs. Thanks. It is both awesome and challenging. One of the most difficult things I have ever attempted and done. They say that more people die climbing Kili than Everest because people underestimate just how demanding it really is. But the exhilaration when you make it and look over to see the sun greet you – it is a feeling I shall never forget. They are very special to me because of their memories. It is lovely to hear that others find them special too. Wow, awesome adventure! Great pic of the mountain! Ok my big dream is to climb Kili. My dad already did it so he isn’t interested. It is on my list!!! Thanks for sharing! It is harder than it looks…at least the last part but seriously worth doing. Yes, my dad did it about 15 years ago. He is a mountain climber or was I shall say. Nepal for me was the hardest trek I’ve done and the highest. Kili is a bit higher than I’ve been. Have you any posts on your blog that I can look at and dream about? The Gorillas of Virunga National Park. Just the thought lifts my heart in to the clouds. spectacular, Jo. what a great adventure. Wow! awesome, Jo. The Mt Kilimanjaro pic is spectacular as are your adventures 🙂 thanks for sharing. Thanks Deepali – so glad you think so. That is truly spectacular! Can imagine how you must have felt when you looked out at that breathtaking view! thanks for sharing Jo, this is so perfect for the challenge! Thanks Madhu…truthfully the thought that really took over: “OMG It is soooooooo cold.” But it was a pretty amazing feeling. Even with the altitude sickness. I remember feeling – peace. Very impressive! I’m jealous and extremely happy for you. That’s quite the accomplishment. I thought so at the time (quite the accomplishment). The altitude sickness was awful. And I ruined a toenail, which had to be removed a few days later (wow was that a tale and a half) and sprained my ankle. Good Lord – how did I ever make it down ??? But it will always be one of the things I am most proud of. Thanks for sharing your adventure despite the lose of a toenails. And, thank you for the photos!! Might have scared off any readers though Brynne. Hogwash! Your eyes, I know, are windows to an extraordinary soul. Might be…but the curtains could use a good clean. 🙂 Isn’t that what your writing and your photography is all about? Cleaning house of all the clutter and reconnecting with the deeper You in you? (which isnt always deep and heavy but light and fun, too!) Ohhh, Jo…how happily I sense your beauty. Your soul/free spirit has always shined thru to me, my friend. Awwwwww…even if it is a little dusty at times…it’s those darn fairies throwing that fairy dust around all the time. As a kindred free spirit who has looked out upon the world from mountain tops (though none so high as yours), I say HUGE kudos to you for this achievement! You have done what not many in this world have done and lived to not only tell the tale, but share the awesome view with pictures! You know I forget sometimes what I have done…then I pull out a photo like this and remember that I have climbed mountains, stood on the edge of a still slightly bubbling volcano, been stroked by a gorilla, seen a chocolate sunset and heard Freddie sing. Life has been good to me. Thanks Cap’n…but I can’t take all the credit. Mother Nature supplies the canvas – I just try to capture it. Sometimes I get really lucky. what I will never be – daring …..!!!!! I love your sense of adventure. Thank you so much Isadora. I love that first image because of all the memories it brings up. As for my sense of adventure. I lost it around the time I bungy jumped and it has been missing ever since.